Well, it has been clear that tomorrow is the day that HTC will be releasing a new variant of the One M8, but for the Windows Phone platform. For the past few weeks, we’ve seen the constant lack of specification, renders came out from various sources. 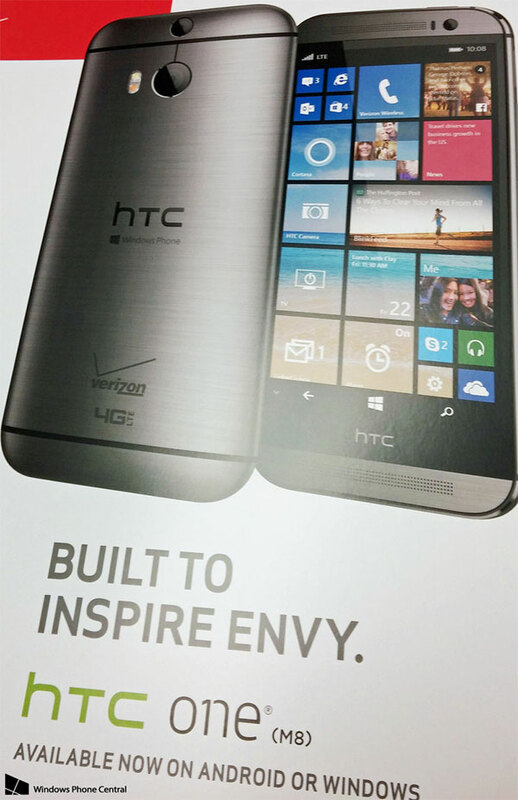 Today, even one day before the launch date, the poster for the HTC One M8 for Windows promotion is leaked. Really hit on the main point of why HTC is making this device, we don’t see any particular name like HTC W8 or “One M8 for Windows”, instead, a statement that is truth, and should be a thing for most big OEMs out there: “HTC One (m8) Available now on Android or Windows.” Yes, for the first time, Americans consumers will be able to chose the platform for their device with little to no compromise, and the company is obviously very proud about it. Beside Verizon, there has been no mention of other carriers to carry the phone. So, are you excited for the device? Previous Will smartwatches become an actual ‘thing’? Next Xperia Z4 Tablet Compact is in the work?